Wanted: Your memories of the Bluesette Club! 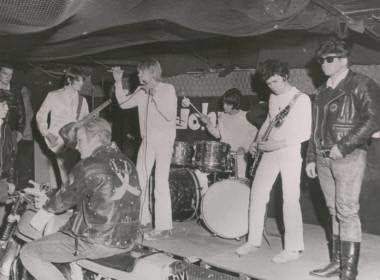 In November, Surrey Hills Community Radio, based in North Street, was very pleased to welcome Andy Ellison, lead singer of 60s band John’s Children, in for an interview about his time in the band. And, in particular, their ownership and involvement in the Bluesette Club. First called The Chuck Wagon, and then the Bluesette Club from 1966, the venue was a corrugated iron hut at 22a Bridge Street. Now a residential parking area behind The Black Dog Gallery. A fascinating aerial photograph from 1969 can be seen in the museum in Church Street. Well, it seems that our town, and especially this club, has quite a musical pedigree. That should be commemorated in a more permanent way. Perhaps by a suitable plaque. Perhaps in the alleyway that still runs from Bridge Street to the site of the club. Why? Well, not only did John’s Children themselves enjoy a certain amount of success, but a member of the band in 1967 was Marc Bolan, later founder of 70s glam-rock megastars T-Rex. And, as Andy said in his interview, they were able to invite other artists to play, that included Cat Stevens and even Jimi Hendrix. Can you picture these artists wandering the streets of our town? More particularly: can you remember these, and others, performing in the club? Perhaps you might even have photographs, that you’d be willing to share? If so, please do let us know! It would then be the intention to publish a further article. And perhaps a presentation in the town. All with the aim of getting our town more properly recognised for its musical heritage. As part of a suitable celebration, the current lineup of John’s Children have already expressed an interest in performing here. Perhaps with their friends, the world famous T-Rex tribute band T-Rextasy, who’ve also expressed an interest. All and any contributions on this subject would be very welcome.